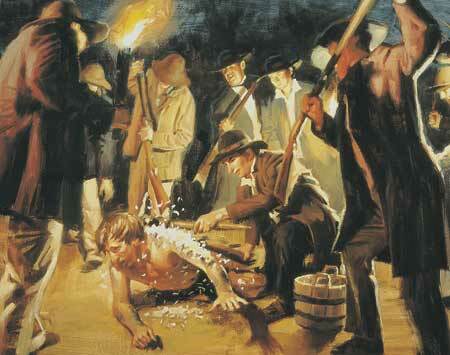 On this day in 1832, in Hiram, Ohio a group of men beat, tar and feather Mormon leader Joseph Smith. On this day in 1837, Canada gives African Canadian men the right to vote. On this day in 1896, A.S. Popov makes the first radio signal transmission in history. On this day in 1944, German troops murder 335 Italian civilians in Rome. Meanwhile, in Germany, in an event later dramatized in the movie The Great Escape, 76 Allied prisoners of war begin breaking out of the German camp Stalag Luft III. On this day in 1958, Rock'N'Roll teen idol Elvis Presley is drafted in the U.S. Army. Chaos ensues. On this day in 1965, NASA spacecraft Ranger 9, equipped to convert its signals into a form suitable for showing on domestic television, brings images of the Moon into ordinary homes before crash landing. On this day in 1972, the United Kingdom imposes direct rule over Northern Ireland. On this day in 1976, in Argentina, the armed forces overthrow the constitutional government of President Isabel Perón and start a 7-year dictatorial period self-styled the National Reorganization Process. Since 2006, a public holiday known as Day of Remembrance for Truth and Justice is held on this day. On this day in 1980, Archbishop Óscar Romero is killed while celebrating Mass in San Salvador. On this day in 1989, thanks to the drunken antics of skipper Ron Hazelwood, the Exxon Valdez runs into some rocks and spills 11.3 MILLION GALLONS of crude off the pristine Alaska coastline. Just to put the magnitude of this waste into its proper perspective: that's enough fuel to keep about a half-dozen of your average SUVs running for an entire WEEKEND! On this day in 1998, the Jonesboro Horror takes place, in which Mitchell Johnson, 13, and Andrew Golden, 11, play a real-life, one-sided game of Unreal Tournament with their classmates. The previous day, Johnson had "joked" with friends he had "a lot of killing to do" because he was upset at being rejected by girls at the school. After pulling a fire alarm, Golden ran to join his buddy Johnson in the woods 100 yards from the school's exit, a sniper's perch from which they fired upon the emerging students and teachers, killing five and wounding ten. When the police caught up with the boys and their stolen van later that same day, they found an impressive array of firearms and other weapons, all of which had been pilfered from the Golden family's massive personal armory. Much to the NRA's chagrin, it was later learned that both boys had been raised around guns, both belonged to gun clubs, and both had participated in practical shooting competitions, which involves firing at moving simulated human targets. Too young to be tried as adults, the boys were held in a facility built special for them by the Arkansas department of corrections, until they turned 21, at which point, both men were released. Sick, sad, and true. On this day in 1999, the Mont Blanc Tunnel fire kills 38 people. On this day in 1999, NATO commences aerial bombardment against Yugoslavia, marking the first time NATO has attacked a sovereign country. On this day in 2003, the Arab League votes 21-1 in favor of a resolution demanding the immediate and unconditional removal of U.S. and British soldiers from Iraq. Believe it or not, today is National Pecan Day in the USA. So today, in order to show your appreciation for all those hard working pecan ranchers out there – those brave men and women who keep our pecan pies nice and jam-packed with delicious pecans – why not go out and beat up a walnut rancher? Come on, you know you wanna!